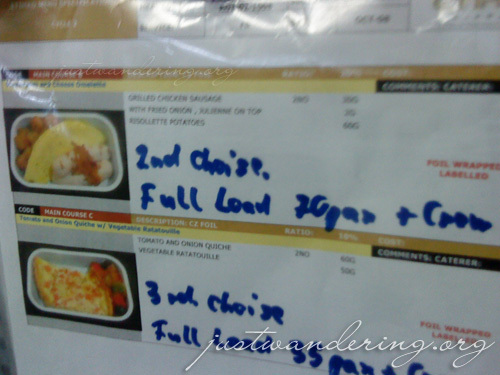 I never imagined how meticulous and strict airline food is prepared. As passengers, we often complain about the food, not knowing how much preparation and care was put on each tray. After the Etihad launching, we were treated to a tour of the Miascor facility, Gate Gourmet’s Manila unit. The company handles the on board catering of airlines such as Etihad Airways, Thai Airways, Royal Brunei, and Hawaiian Airlines. Upon delivery of ingredients, temperature is taking to ensure that each ingredient is at its freshest. They are then marked based on the date of delivery and stored accordingly. Canned goods are stored in a warehouse that can easily be mistaken for the inside of a Makro and vegetables are stored in a walk-in fridge that’s chilled at 18 degrees Celsius. Meat, fish and poultry are stored in a sub zero walk-in freezer, with a 5-degree thawing room at its entrance. 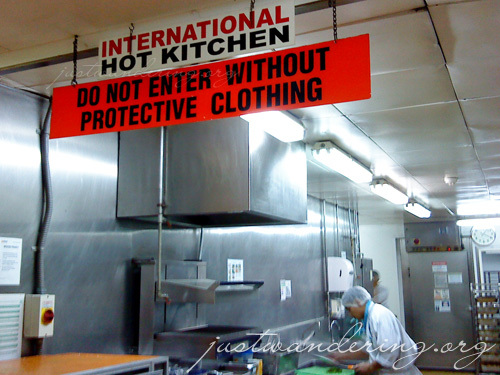 They are very strict with keeping the Halal standards. All Halal food items are stored, cooked and prepared separately from the non-Halal. Toured the kitchen cooking the different dishes for the airlines. There was an industrial-sized basin, wherein one woman was cooking scrambled eggs. It was huge! The lady said that it takes her 20 minutes to cook the eggs, with her stirring it the entire time. Each portion of the meal are assembled in the facility, and there was a time pressure to ensure that each dish was at its optimal freshness. After packing the meal, it was cooled for storage up to a certain degree then brought into a certain temperature for loading on to the plane. In the kitchen where appetizers and desserts are prepared, the atmosphere is more relaxed. 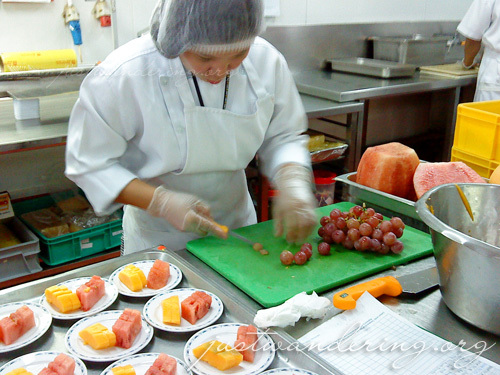 There were crew members peeling, slicing and dicing fruits with precision that can only be had with much practice, and a pastry chef making dainty chocolate toppings. Each step in assembling airline food is very methodical. In each station, there’s a picture of how each tray should be prepared in all classes and airline. There were specifications on the cutlery to use for first, business and economy. There are machines that aid the workers in preparing the food, but it’s still mainly people working with care on each tray. It was a very enlightening tour to say the least. I’ll never bite into another airplane food without thinking of how fastidiously it was prepared. Thank to Etihad Airways for the opportunity and to Miascor for letting us tour the facility. Hi..I just love all your blogs specially the topics. All about travel. Keep it up! Looking forward to the next one. I also think the food in the planes are awful. I remember having been into PAL’s kitchens back when I was very, very young, before my first airplane trip. I’m not sure if it was Miascor though. But I do remember being amazed at how busy it was, and how meticulous the preparations were. Ever since then I’ve found few reasons to complain about the quality of airline food, except when it’s just too oily (something that plagues airline carriers which insist on cooking Chinese food for the skies, it seems) or if the taste is just so … vague (like during my recent trip with Cathay Pacific, where they had this… croissant-thing).